So who's got the popcorn in for the show? Me. Watching from the outside in despair at what my country has become (a world laughing stock, for one) as I wait for my application for French citizenship to go through. der untergang with plastic beads and a pugin gothic revival setting. it seems fairly certain quite a few who voted leave may have decided it was a bad idea and some of those who voted leave to stick it to cameron etc might well not vote to leave in another go. Not sure if that image is displaying. It's not working for me, but neither is the yellow jacket. Which crossings are used for the French and German cars and wine? Dover is the major route. https://on.ft.com/2Dh3Ory I have gifted this article, so you should be able to read it. Greater than 90% of French wine exports won’t be impacted by Brexit. German Cars? Which ones? The BMWs and Minis made in the UK that are down scaling their prodiction, cancelling new factories and setting up in Eastern Europe? 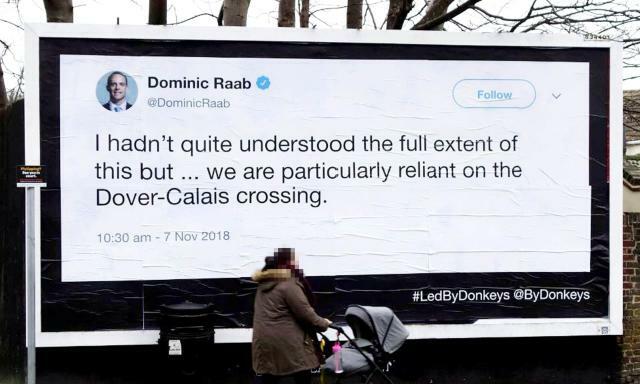 They go via Dover mostly. But the newly unemployed British workers won’t worry about that soon. dover is also a RSG ( or whatever they call them these days ) so as well as the port issues there could well be strategic route and security considerations to consider if the castle goes active " in support of the civilian powers"
Actually,i was thinking more of Audi,Peugeot,Renault etc,but you can add a large list of Agri equipment to that. I seem to remember a number of firms transferring to the EU and outside it before 2016,what`s new. New Holland tractors at Basildon is a shell of what it used to be, as is Ford at Dagenham. Ford have been talking about making Dagenham one of their main electric drivetrain providers, this will not happen if our deal is a bad one, in the case of no deal I guess they'll sell all their high land value sites in Essex and move those functions somewhere cheaper. We have also seen the EBA & the EMA move to Europe. This will translate to the relocation of assorted offices of major pharmaceutical companies, financial institutions, and their associated lobbyists and consultancies. hitachi and toshiba have decided not to fund and construct the sellafied and wylfa reactors which leave about a third of the planned replacement capacity still ongoing, ongoing includes at least one that might never get finished due to technical/admin issues and iirc 2 that have been thought about but not fully committed to . overall the 30% of base load that nuke was to supply is now less than 10% organised and the last few existing plants are overdue for decommissioning already. on the subject of logistics dover alone does over 15000 wagons a day, there will be only 5000 lorry permits for the uk to operate in the eu so most cross border movement would be in eu lorries and they will not want the job if it involves a day driving and a week in traffic jams and customs. on the subject of ni the idea of a thousand mainlaind reinforcements to support the psni in case of civil unrest is so mental one can only think there are some who would favour a remilitarisation of the 6 counties. ps civilians are a problem rather in need of help in most emergency plans of this nature. Trucks would face six-day queues to board ferries at Dover if new customs checks in the event of a no-deal Brexit were to delay each vehicle by just 70 seconds, according to government-commissioned research. A summary of the analysis obtained by the Financial Times claims extra processing time of 80 seconds per truck would lead to “no recovery” — described by an official as widespread permanent gridlock. The research, carried out by academics at University College London for the Department for Transport, will add to misgivings about the potential disruption of a disorderly exit from the EU. The research was presented to ministers in 2017 but never published. On Monday the DfT conducted a live rehearsal of an emergency traffic system that will be introduced to prevent congestion at Dover in such circumstances. The trial used just 89 trucks to test out the disused Manston Airport, which will be used as a car park for 6,000 trucks under the contingency plans. 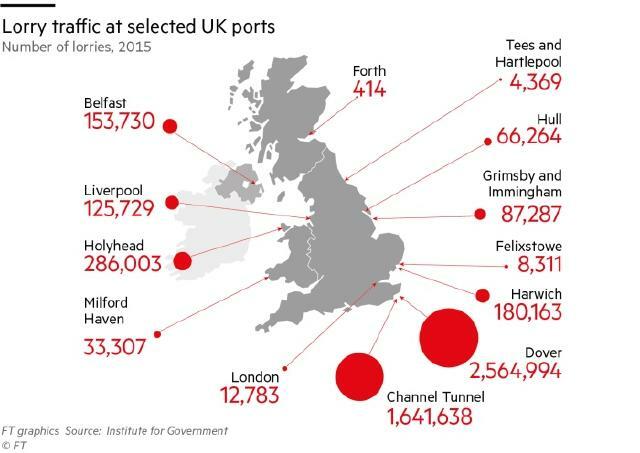 The Port of Dover, which handles up to 10,000 trucks a day, believes no-deal Brexit would lead to 17-mile tailbacks, while the government has estimated there will be an extra 200m customs declarations a year. The UCL research was based on the impact of different processing times for outbound journeys using Dover’s existing layout and traffic flows. It anticipates that extra customs checks of up to 40 seconds per vehicle would have no impact on the queueing time for outward journeys through Dover. However, that changes dramatically when the additional delays are only slightly longer. With a further 60 seconds of checks, officials anticipate queues of six to eight hours on Tuesdays, Wednesdays and Thursdays, when traffic is particularly heavy. If delays reach 70 seconds per truck, a queue of between 1,200 and 2,724 heavy goods vehicles is expected, leading to tailbacks taking six days. “[The queue] starts Monday evening and ends by Saturday noon,” according to the analysis. If the processing time goes up to 80 seconds the result would simply be “no recovery”, it says. “‘No recovery’ would mean the whole country is in a traffic jam,” said one official. Separate research by Imperial College London has predicted “paralysis” on the M20 motorway and A20 trunk road if new customs delays are introduced. Ke Han of Imperial predicted nearly five hours of traffic delays in Kent at peak times, with an extra two minutes spent on each vehicle at the border tripling existing queues on the M20/A20 to 29 miles. Current security and passport checks take up to two minutes, according to one estimate by Dr Han, but freight vehicles do not have to complete customs declarations, which could change under a no-deal Brexit. Updated advice to government departments from officials last week warned that there could be six months of reduced access and delays at Dover and nearby Folkestone if there was no deal. That was dismissed as “Project Fear on steroids” by Andrew Bridgen, a Tory Brexiter MP. Won`t there also be queue`s in Calais and other EU ports,or am I missing something in cross channel trade?